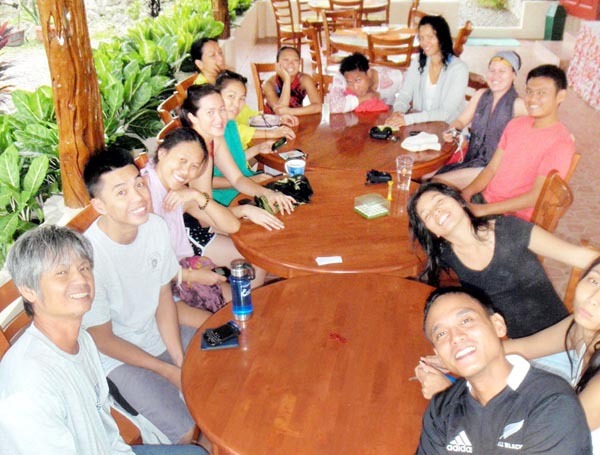 After 7 days in Dumaguete at Harolds Mansion, it felt time to move on again. 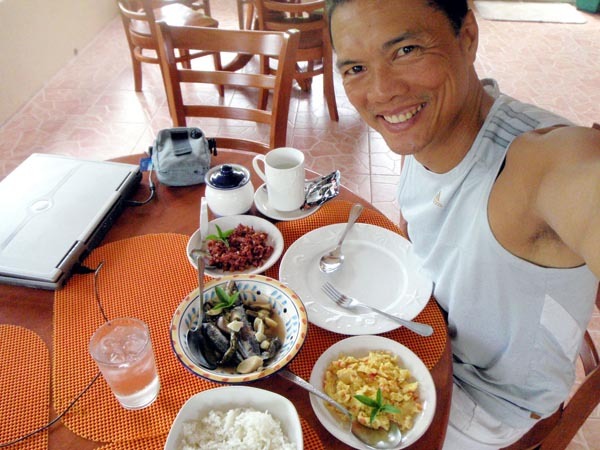 Everything I needed to do in Dumaguete has been done - launch a marine lab website, conduct a web training seminar, free diving at Dauin's marine reserves and renew a hotel and dive resort subscription. There was nothing on the immediate horizon anymore. Next stop? Hale Manna Beach Resort in Moalboal! Moalboal is a 7.9 has. municipality that extends to a peninsula on the southwest of Cebu Province. 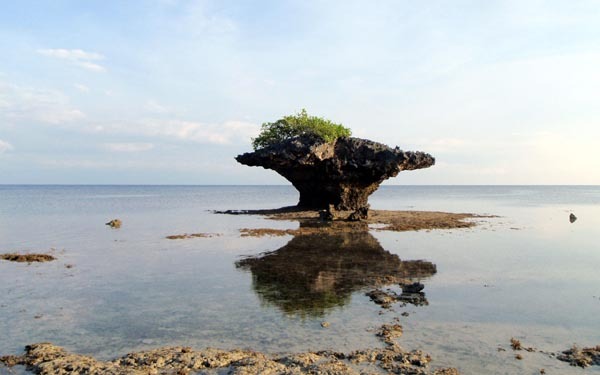 By land, it is 89 kms or 2.5 hours from Cebu City. 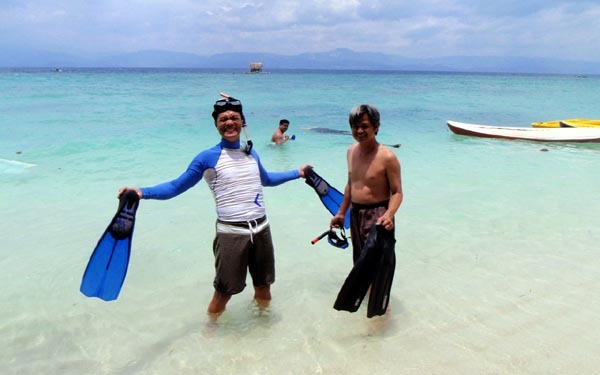 Because of its diverse coral reef system and rich biodiversity, it is often regarded as Diving Paradise of Cebu. Scuba diving and free-diving is the main tourist attraction. There are 2 areas popular to tourists - the Panagsama Beach (Basdiot) or White beach (Basdaku). Basdaku is known for its shifting white sand. It's more quiet and isolated while the Basdiot sees more action with its generous sprinkling of bars, resorts and restaurants. I stayed at Hale Manna in Basdaku. 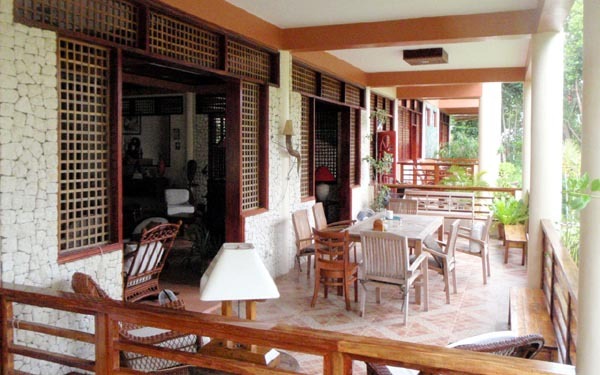 Hale Manna is a sprawling 2.85 hectare compound right off the northern tip of Moalboal. Most of its limestone area is groomed to make for a manicured coral garden. Is has 8 spacious rooms on a two-storie columned infrastructure. 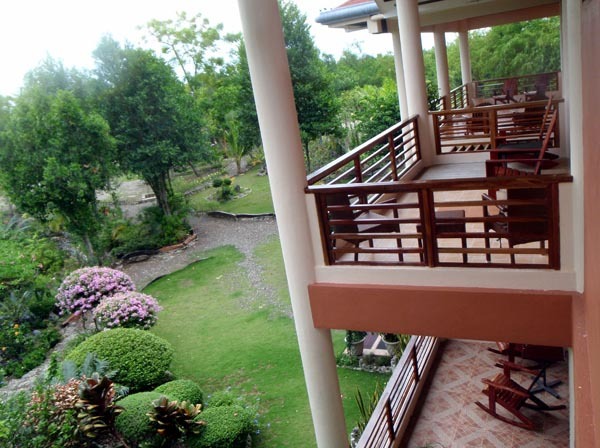 The upper rooms have their own private veranda overlooking the garden. The entire resort is finely appointed and tastefully designed with its clay-inspired hue reminscent of Sante Fe. 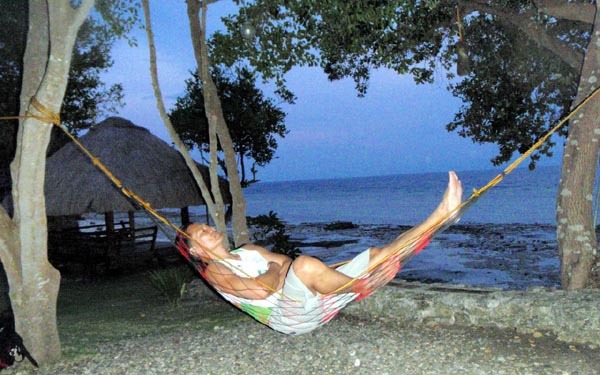 Water pressure is good, washroom space is generous, food is delectable, hammocks are placed right by the beach, and chillout huts are likewise placed along the coastal property line. Staff, headed by M'am Marcela, is friendly, helpful and efficient. Perfect? Not yet. I have a wish list. For undisturbed time to accomplish some computer work, Hale Manna is perfect. It's quiet with just the waves and bird chirps in the background. Given the backlog I still had to do - prepare my motivational talk to the graduating batch of tourism graduates at the Mariano Marcos State University, prepare for my web design workshop, develop an ayurveda website, launch an industrial 3D printing website and lots of little one-offs that needed to be off the ground (including a webpage for someone who wants to sell a solid gold Rolex), I was just glad to find this solitary place and quality time. I had 9 days to finish all of that before my yoga friends would come for a yoga retreat. 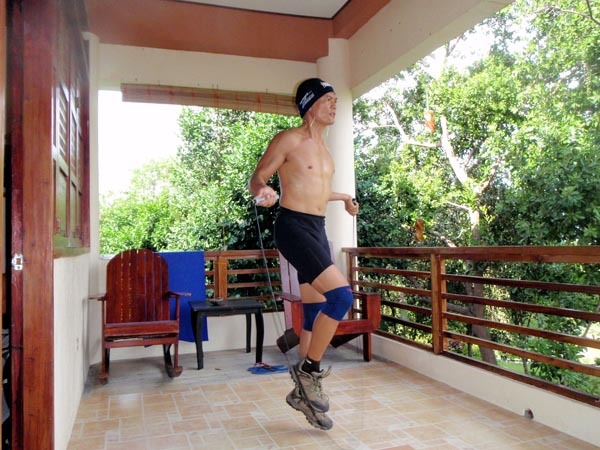 For the most part, I was on my veranda doing yoga in the morning, followed by a complimentary sumptuous breakfast (as part of my double-occupancy room inclusion), and then do my web work in the lobby where wifi is available. I'll be there the entire time until my head tells me to drop everything and take a walk. The afternoon walk along the beach is therapeutic as I recover from the day's mental exhaustion. 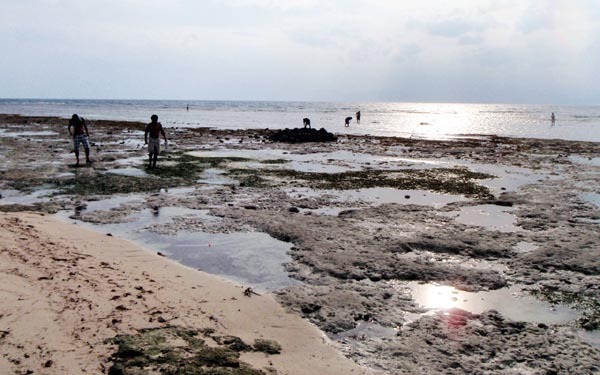 I would see people by the shore collecting edible shells trapped on the coral floor by the low tide. Further down south is Basdaku, the commercial area for carinderia eats, karaoke and cheap beer. 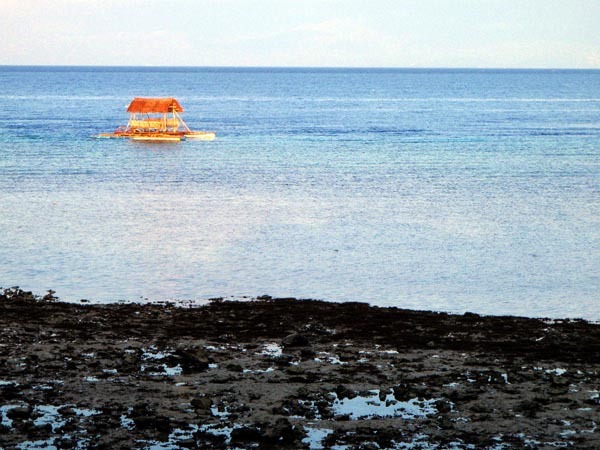 The beachfront coral reef was tempting specially with the anchored raft that served as a floating chill zone. To my pleasant shock, when I got to the reef area, which was a swim away after passing through the grassy sea bed, I came upon what I would describe as pristine reef that can easily rival the Marine Sanctuary of Apo Island. The corals were mostly soft spongy type but it was intense. To make it even better, the drop-off was a near-vertical abyss that plunged down 40+ meters to a dark forboding realm. It was my chance to go free-diving. Easter eggs popped out as I went deeper - juvenile Titan Triggerfish, turtle, large parrot fish, etc. Snorkeling southward alongside the drop-off, I was maybe a kilometer away already, in front of Basdaku beach and the coral reef still extended south. I was told that the reef system encapsulates the entire Moalboal peninsula - whoa! After my first dive, I immediately texted a high school buddy whom I used to go snorkelling with back in the day, "Dude, you gotta come and see this reef!". 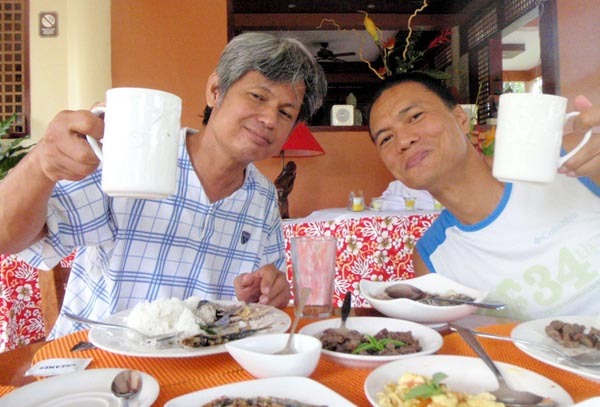 Luckily, he was stationed in Cebu City. He was at the resort the following day. For two days, we'd just plunged down the abyss and coasted on the coral edge until Basdaku, to which we'd help ourselves to cold beer, karaoke and grilled bbq. 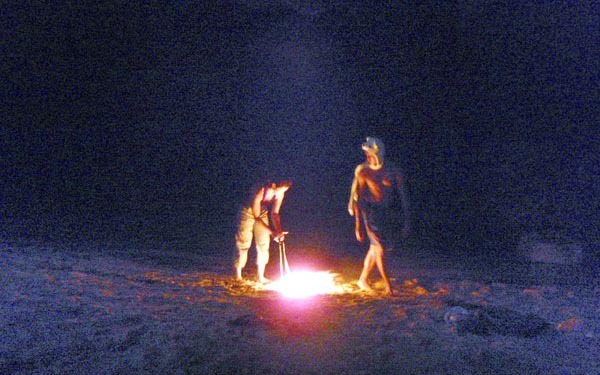 After that unwinding, it would be time to go back into the reef and snorkel with the current back to Hale Manna. It was like high school all over again. Intent on spreading the love and sharing my bliss, I invited my yoga group to come and have some overnight fun. After negotiating on the nuts-and-bolts of the accommodation with the owners (which had many snags, but finally resolved), my group got nicely tucked-in - all 15 of us! This was also a great way to introduce the resort to like-minded individuals who can appreciate the place for what it offers. 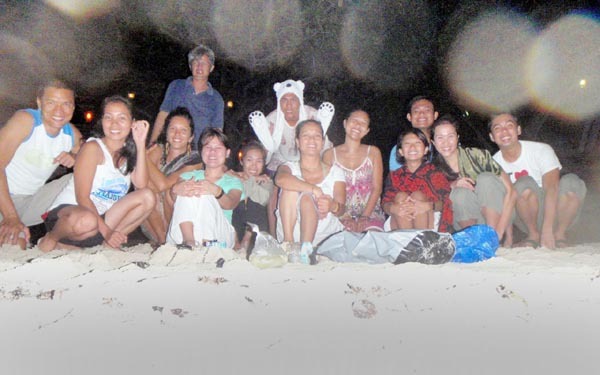 It was fab bondng with Jeanne, Noricel, Jang Jang and my yoga friends whom I haven't seen since I left Cebu for Dumaguete. Gem who recently left for the US was missed. Arlien was conspicuously absent (LOL!). We hung at the beach hut, took pictures, talked, snacked, dozed-off and chilled. 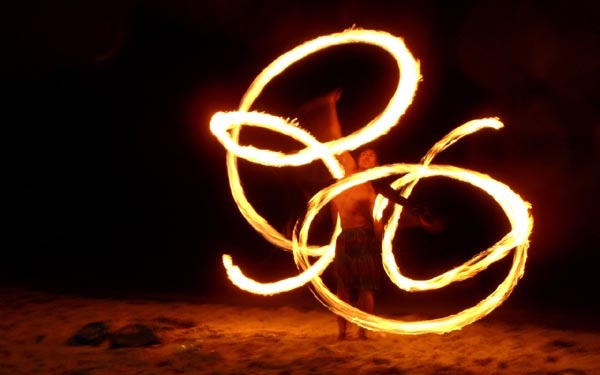 In the evening, the scene was ripe for fire dancing. With Reds' competent tutelage, nearly everyone put on a poi show. The highlight of my entire stay was the 4km drift snorkelling from the marine reserve of Tuble, a short tricycle ride from Hale Manna. Only 6 of us went on, while the others conducted their yoga practice back at Hale Manna. Geared up with our snorkeling gadgets, we skirted the marine reserve and followed the northward direction of the drop-off. From where we started, we could not even see Basdaku. I knew it would be a long drift. The two females who joined us, Nandinii and Celeste, were intrepid snorkelers who dared the deep end. Jason was a strong swimmer who braved the drift without a snorkel! Reds had his snorkeling debut - wish it was that good when I had mine. We got excited seeing our first turtle, but we encountered too many, we were ignoring them at one point! It was 3.5 hours by the time we reached the beach at Hale Manna. We were exhausted and hungry! Normally, I'd negotiate for a room just for myself and invite friends to be my plus one for breakfast - that was fab. But now, I kicked it up a notch - by negotiating for big rooms for my friends so we all get together and chill for a night (or two!). How cool is that? Since this is the first time, snags were expected but there were lessons learned - the next time will be more streamlined. Yeah, it'll keep getting better - not just for me and my friends, but for my online community (who benefit from impartial ratings posted by my friends) and the establishment (because they are introduced to people who can put the word out). Like I always say, everybody happy! (Jun 2, 2013) I love the place too! Snorkeled and free-dived along the reef. 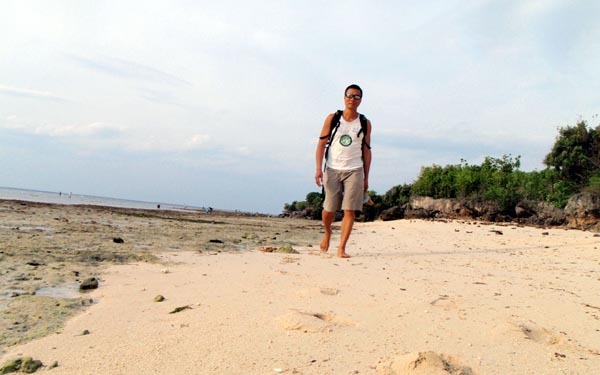 Is it really comparable to Apo Island? I haven't been there! 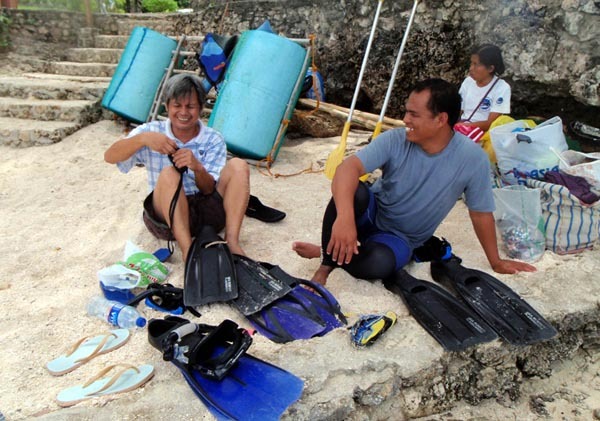 (Jun 2, 2013) parts of it are comparable to Apo Island. The difference perhaps is diversity. Moalboal has a massive reef system but essentially the same kind. 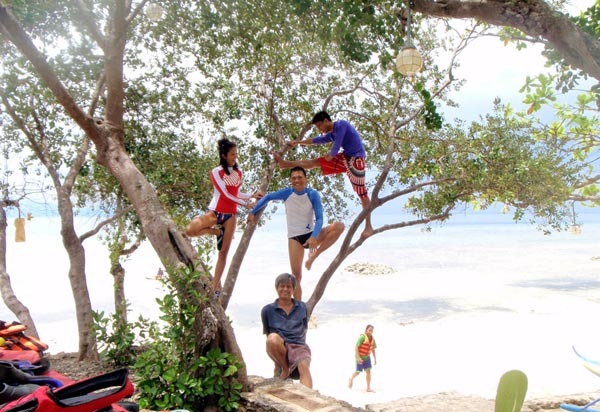 In Apo, a dive spot may be very different from another dive spot. (Sep 24, 2012) Images of graceful sea turtles, schools of fish, and us, agile swimmers float around in my mind. Thank you for the riveting snorkeling tutorial and for the good times. I wish you safe travels and may you continue to express your love in all those creative ways. (Sep 23, 2012) Thank you so much. We had a wonderful time. Hope one day, our paths may cross again.